A parliamentary motion opposing a controversial £8million golf development in Sutherland has been lodged by MSP John Finnie, who claims it would be “catastrophic” for the local environment. US businessman Todd Warnock and globally renowned golf course developer Mike Keiser are driving the proposals for an 18-hole course at Coul Links, just north of Embo. Highland Green MSP John Finnie said the area is recognised for its important salt marshes and dunes and is also home to a huge range of bird life. He has welcomed the campaign from RSPB Scotland, the Scottish Wildlife Trust and other conservation bodies against the proposals. He said: “This proposed development has all the hallmarks of Donald Trump’s Aberdeenshire development and should not be given the go-ahead under any circumstances. “It will be catastrophic for the precious dune land environment and the many species which inhabit the area. It is designated as a Site of Special Scientific Interest and an international Special Protection Area. He added: “It will be interesting to see any official analysis of the impact this destructive proposal would have for Scotland’s near £300 million wildlife tourism industry. Consultation events over the golf plan have taken place over the last few months, and Mr Warnock claims surveys show over 86% of the public were in favour of the development. He added that there are more than 30 courses in Scotland which have been built on SSSI land, suggesting it’s not unusual. 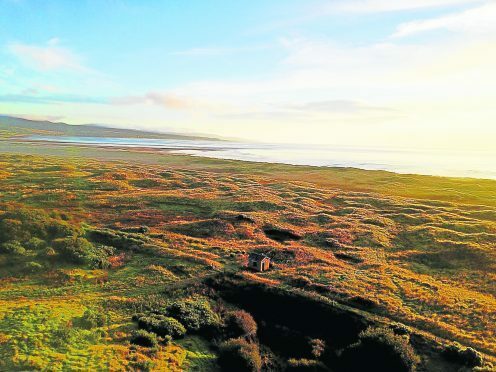 The businessman stressed that although 34.6 acres of the Coul Links golf course would be located inside the SSSI, the architects would remediate 14 acres of a felled tree plantation and 35.3 acres of land between the SSSI and Embo will be managed under the overall site plan for the SSSI.